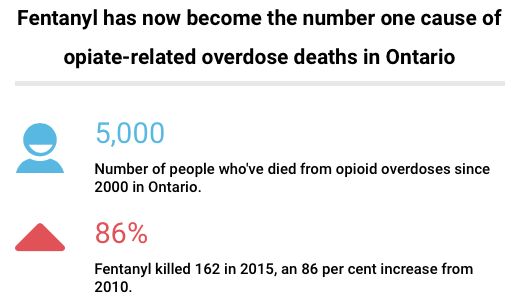 Fentanyl is now the number one cause of opiate-related overdose death in Ontario. In depth: Part one in a three-part series examining the opioid crisis in the city. 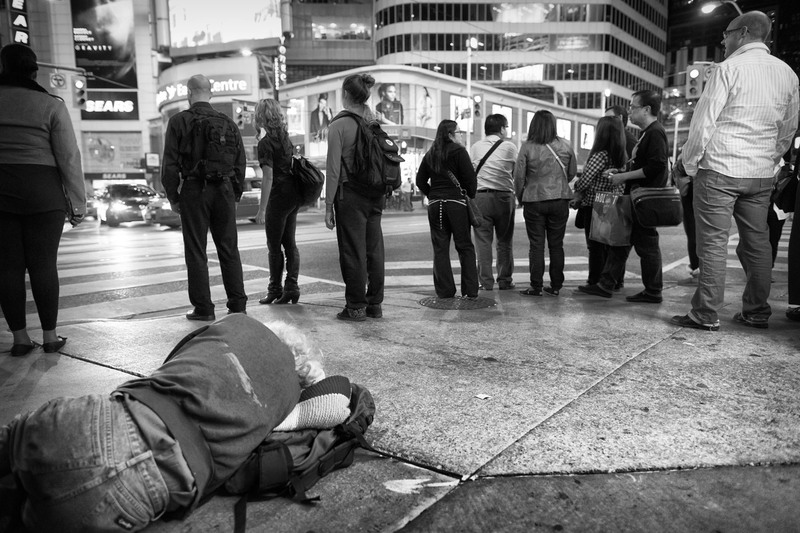 During the late afternoon hours on New Year’s Eve 2015, Amy Wright, a community support worker in the 24-hour harm reduction drop-in at Sistering, noticed a homeless woman with no jacket or shoes, laying on the ground in her own vomit outside a busy Starbucks on Bay and Dundas in downtown Toronto. Her legs were bent, swaying right to left. The woman, whose breath was extremely shallow and eyes were fluttering open and closed, wouldn’t respond to Wright. After Wright stopped to help, two other people did as well. While they were discussing whether to call an ambulance, Wright gave the woman a shot of naloxone—a safe medication that reverses the signs of overdose by blocking the effect of opioids in the brain. Wright said the woman refused to stay for the ambulance and went on her way. Toronto’s three supervised drug-injection sites are expected to open this summer, according to Councillor Joe Cressy (Ward 20, Trinity-Spadina). While the City says it plans to take a harm-reduction approach to the sites, the recovery process for users will demand more than just packaged needles, rubber syringes, and alcohol wipes. Toronto’s sites are expected to cost about $400,000 to create the spaces and have an estimated annual cost of $1.6 million. Although the province has not specified the dollar amount it will be contributing, Ontario committed to funding the City’s three supervised-injection sites about six months after it was approved by City Council. Wright was born and raised in Brampton. In her late teens, she was given Fiorinal for migraines—which started when she was eight years old—eventually abusing it every other weekend, whenever her doctor wrote a new prescription. She would black out for days, ending up in the hospital four times because of an overdose. By her second year at York University, where she was a sociology student, Wright had built up a tolerance to Fiorinal, taking 50 to 100 pills over a two- or three-day period. She left school that year because she was drinking almost every day and occasionally overdosing on Fiorinal. “Because my overdose was a mix of opiates and benzos, I had to drink charcoal and sometimes I was [held in hospital] for 72 hours because they claimed that I said something in the ambulance,” Wright said. Under the Ontario Mental Health Act, physicians can sign a Form 1, if they’ve examined a patient within the previous seven days and believe they need to undergo a psychiatric assessment, in which they are detained and evaluated in a facility for 72 hours. Wright would drink charcoal because it clings to the drugs in a person’s body, preventing them from being absorbed into the blood. She described the drink as awful, chunky, and thicker than a milkshake. She said it’s hard to get down, but the alternative is getting your stomach pumped. Depending on the amount of drugs in a person’s system, they might have to consume two to five glasses—the most Wright has had to drink is four. She was also given Percocet by her doctor at 19 for an ovarian cyst because Tylenol 3 was not helping. “It was [my] first time having it and I will never forget how alive and real I felt, having battled unknown, undiagnosed depression all my life,” Wright said. Wright added that she would go to her family doctor, then to a walk-in or an ER doctor to get as many prescriptions as she could. By her early 20s, Wright was buying percs and morphine off a guy from work on a daily basis. She was also still getting her prescription for a month’s worth of Fiorinal, which she would sometimes finish in three days. 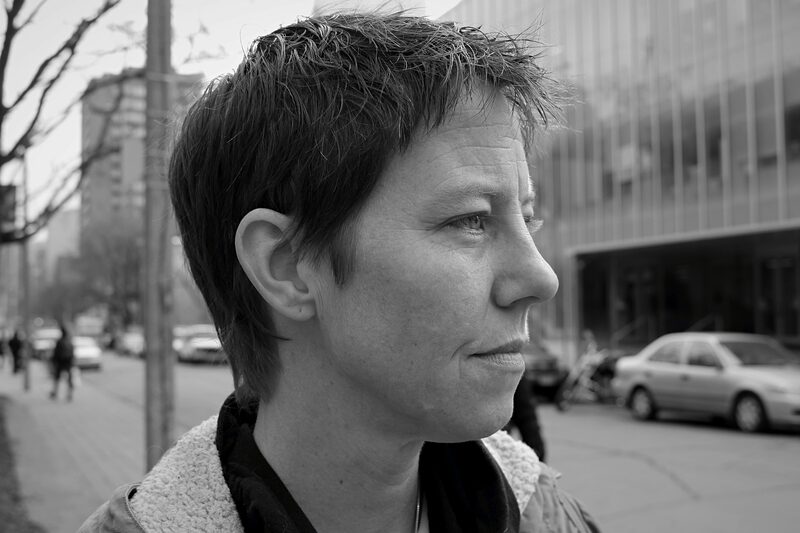 At 26, Wright walked herself into an abstinence-based treatment program, The Jean Tweed Centre in Etobicoke, for the first time. For eight months, the 21-day residential program was a support system for her. She even stayed overnight at a house close to the main centre. But Wright’s migraines returned and she was struggling with her mental health. She did the Individualized Counselling Program at the centre, meeting with a counsellor every week for one year. Wright was then diagnosed with fibromyalgia and was put on painkillers and sleeping pills. She built up tolerances to Percocet, Oxycocet, Imovane (a benzo-sleeping pill), and lorazepam. During the time, she also switched from beer to hard alcohol, sometimes drinking right from the bottle. She dropped out of her third year in the social work program at Ryerson University because all of her money was going to booze and prescriptions. No longer in school, she lost her health insurance. She was left with debt and ended up on the streets. “I’m grateful that the safe-injection sites are coming to Toronto because if I were to ever go back and use heroin, I have somebody who can watch over me and make sure that I am okay,” Wright said. In June, Toronto city councillors voted 36–3, on a proposal to support three separate supervised-injection sites in the city’s downtown core. The three supervised injection sites locations are Queen West-Central Toronto Community Health Centre on Bathurst Street, the South Riverdale Community Health Centre near Carlaw Avenue, and the Toronto Public Health-operated needle exchange at Yonge and Dundas streets. Image via Google maps. Toronto’s application was submitted to Health Canada on December 1. However, the proposal currently sits without federal approval. The City needs the formal approval of the exemption application in order to operate the sites. Early last month, Health Canada gave Montreal the approval to open three supervised drug-injection sites. Montreal is now only the second city in the country, aside from Vancouver, to have safe-injection sites. In December 2016, federal Health Minister Jane Philpott announced that the government would replace the National Anti-Drug Strategy with the Canadian Drugs and Substances Strategy, which is supposed to establish harm reduction as a part of Canada’s drug policy. Simultaneously, Philpott introduced Bill C-37. The bill, still working its way through Parliament, would amend the Controlled Drugs and Substances Act, the Customs Act, and the Proceeds of Crime (Money Laundering) and Terrorist Financing Act, speeding up the process for approving and operating supervised-injection sites. Bill C-37 also proposes to prohibit the import of pill presses that are unregistered, as well as remove the exception currently placed on border officers to open mail only when weighing packages more than 30 grams. This would allow officers to open international mail of any weight if they have reasonable grounds to suspect the item may contain prohibited, controlled, or regulated goods. The legislation would also make it a criminal offence to possess or transport anything with the purpose of using it to produce controlled substances, allow for temporary scheduling of new psychoactive substances, and support faster and safer disposal of seized chemicals and other dangerous substances. Under the current legislation, the Respect for Communities Act, those who want to operate a supervised-injection site have meet a number of requirements, which Bill C-37 cuts from 26 to five, set out by the Supreme Court of Canada. Bill C-2 also requires applicants to get a letter from the local police chief for any exemption for drug-users to be able to inject illegal drugs under the care of medical professionals. 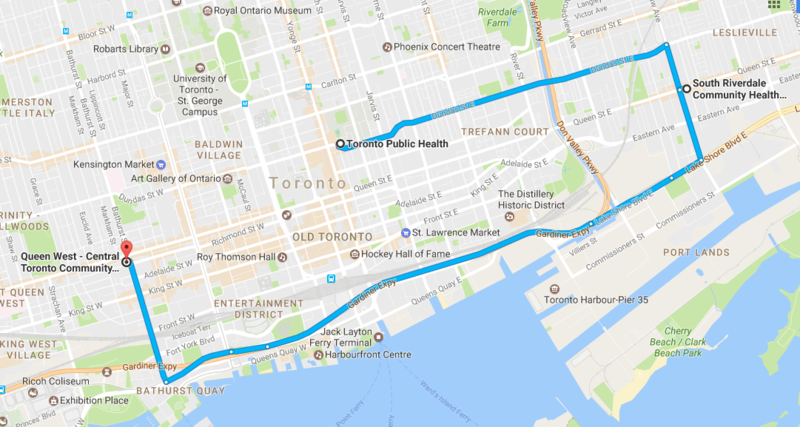 There are three potential spots that the Toronto Board of Health has designated as spaces suitable for supervised-injection sites: the Queen West-Central Toronto Community Health Centre on Bathurst Street, the South Riverdale Community Health Centre near Carlaw Avenue, and the Toronto Public Health-operated needle exchange at Yonge and Dundas streets. Decisions on staffing levels will be made based on a number of considerations, most notably funding levels, according to Shaun Hopkins, manager of Toronto Public Health’s needle exchange program. In 2016, over two million needles were distributed in Toronto. In 2015, almost 1.9 million needles were distributed along with other sterile injection supplies through community agencies across the city. In a statement released on February 24, Mayor John Tory detailed a conversation he had with Philpott over the phone. Tory said they discussed the crucial need to have more data available faster. 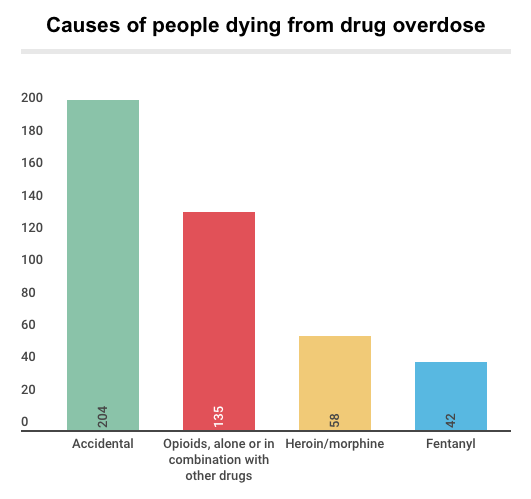 The coroner’s data shows that of the more than 250 overdose deaths in 2015, deaths involving fentanyl–a painkiller up to 100 times more toxic than morphine–surged. And officials say, carfentanil, an even deadlier drug, is on Toronto streets. 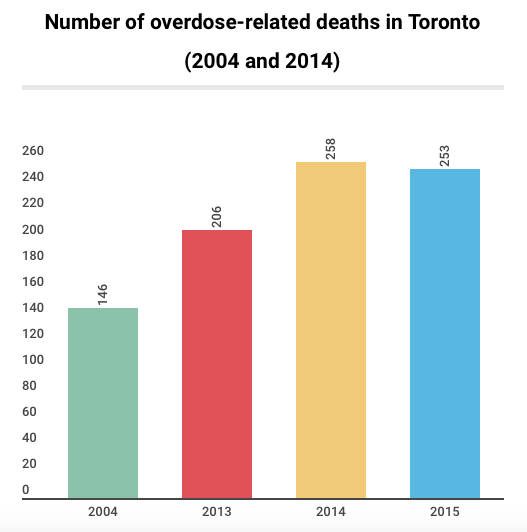 Dr. Barbara Yaffe, Toronto’s acting medical officer of health, is blunt, calling overdose deaths of more than 250 Torontonians a year a “preventable epidemic,” reports the Toronto Star. Tory also said there was an extensive discussion about the need for expanded treatment options, and mentioned he will be raising some of the issues, including the lack of supportive housing and adequate treatment programs, with the Ontario government in the days ahead. Over 5,000 people died from opioid overdoses since 2000 in Ontario. Fentanyl has now become the number one cause of opiate-related overdose death in Ontario. Fentanyl killed 162 people in 2015, an increase of 86 in 2010. 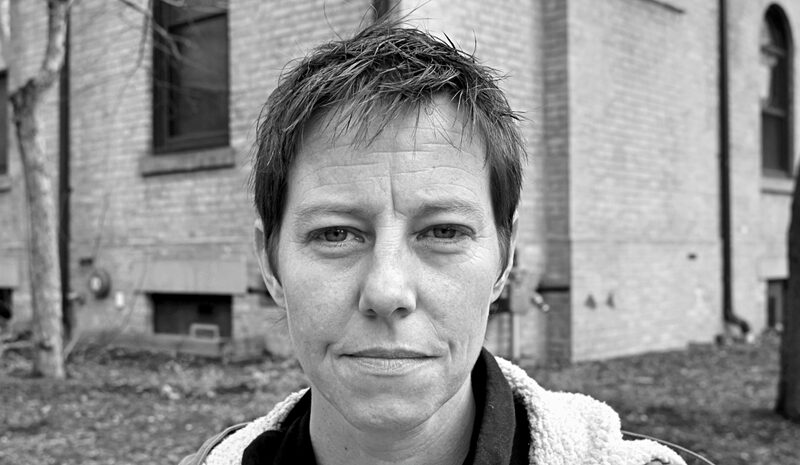 When conducting evaluations on the three locations, Hopkins said, the use of the service, the satisfaction of the people who use the service, and of those in the neighbourhoods surrounding the service, the number of injections conducted at the site, and the number of overdoses at the site, will all be looked at. Fifty-four per cent of people who inject drugs do so in a public place, such as a washroom or stairwell, while 46 per cent inject on the street or in an alley, according to the 2012 Toronto and Ottawa Supervised Consumption Assessment Study. About half of all people who inject or smoke drugs said they would travel 10 blocks or less to use supervised injection facility, while 28 per cent said they would travel more than a kilometre. The study revealed that most people in Toronto who inject drugs, injected cocaine (including crack cocaine) and opiates in the six months before being interviewed. 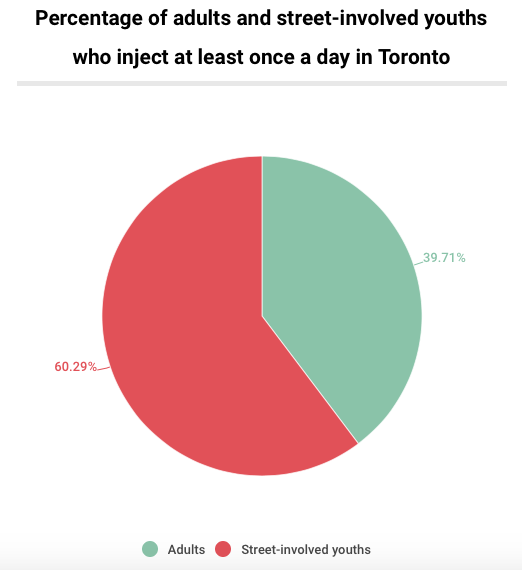 According to the 2012 report, Toronto and Ottawa Supervised Consumption Assessment Study (TOSCA), 27 per cent of adults and 41 per cent of street-involved youths injected at least once a day in Toronto. Eighteen per cent who inject drugs in Toronto reported they had used needles that had already been used by someone else. 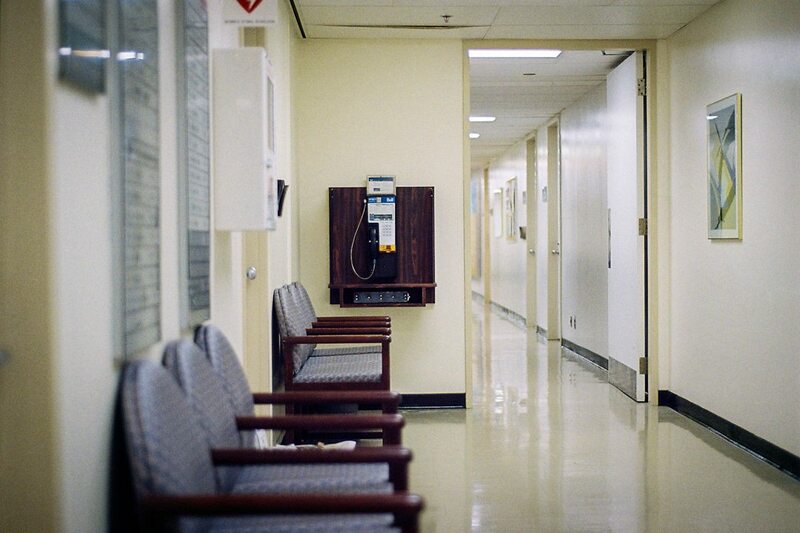 In part two, Torontoist will look at how one hospital in the City deals with drug overdoses and Amy’s experience at Vancouver’s Insite.